A feeling of sheer terror washed over my body, an almost debilitating and numbing feeling impossible to erase from my memory. 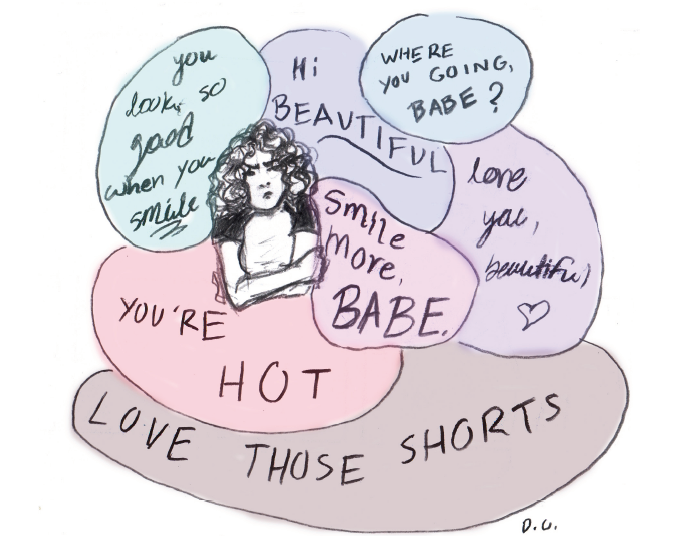 There is a stigma around the term “catcalling,” a modern term that describes verbal sexual harassment. It’s a problem that the majority of women face at least once in their lifetime. Although it happens so frequently, it is rarely discussed for fear of sparking controversy about freedom of speech or feeling ashamed for bringing up a “vulgar” subject or “social taboo.” Because of the tremendous emotional toll that catcalling takes on a more than half the population, it is necessary for our student body to welcome conversation surrounding it in a classroom setting. Instead of pushing the issue under the rug we should raise awareness, hopefully halting the trivialization that usually results from lack of exposure to this reality. I decided to share my own story to spark a conversation. Sometime last year, in eighth grade, I took a different route than usual walking home from school. I had this weird sensation as if every pair of eyes on the street were glued to me and sizing me up. And apparently enough, when I walked past a vacant garage, a man, who was roughly 40 years old, called out, “Hey, guys! Check her out!” I froze in my tracks, feeling my face go sallow and pale. The vulnerability I felt in that moment was unshakeable. I picked up my step, wishing the immediate feelings of fear and guilt would go away. By the time I knew it, I was sprinting down the street when I turned around to see the man following me with his two friends. They were menacing and considerably stronger than I was. They continued to follow me two more blocks, casually strolling behind me, prodding and joking with each other. Eventually, after they’d had their fun, they merely walked away and I haven’t seen them since. But they left a lasting impact on my self-worth and comfort. I’ll never forget the utter anxiety and horror I felt that afternoon. One year later, and the idea of walking that street threateningly hangs over my head. Some would claim being put in my situation would be flattering, that they’d become more brazen and outgoing. Others might say that maybe what I was wearing had something to do with it, that the man felt “obligated” to catcall because I was wearing something labeled as promiscuous and risky. And some might even say that I could have stood up for myself, that I had the opportunity to but I allowed myself to be victimized. For me, it is not flattering nor does it send my ego and self confidence soaring. It instead, leaves me feeling incredibly vulnerable and with a heightened awareness of my surroundings. I didn’t know how to handle the situation I was put in for I had never been exposed or even educated about this social issue. I was only able to consult articles like one written by the New York Post titled “Hey, ladies– catcalls are flattering! Deal with it,” which claimed I should feel blessed and honored by the comments. If catcalling were discussed in classes such as HMO, health class, or life skills, people at an earlier age would know how to deal with the potential situation. I could’ve then had a chance to share my own experience in a safe place and come to a conclusion about how I felt. I instead was influenced by a subjective article that convinced me to reject my previous reaction to the harassment. Classes could easily introduce this topic in the discussion by analyzing a personal statement of a victim of verbal harassment and gently easing the class into the concept. It shouldn’t matter what I’m wearing, how high I’m holding my head, or my response to the situation, because having someone put you in that uncomfortable position so nonchalantly is wrong. Not because it’s considered to be socially unacceptable or crass, but because it really leaves a lasting impact.